The study of Moon phases and stock market returns by Kathy Yuan, Lu Zheng, and Qiaoqiao Zhu, which we can call the YZZ study, is one of the most frequently cited research experiments to have found significant evidence for an astrological hypothesis. Although the authors do not explicitly mention astrology in their paper, their investigation is inherently astrological and they offer no other explanation for their results. The literature that YZZ consulted for their study indicated strong empirical evidence that investors do not follow rational judgments when making investment decisions but are prone to various psychological and behavioral biases, such as loss-aversion, overconfidence, and mood fluctuations. To better understand these non-rational decisions, the authors decided to look at observable variables for mood and sentiment that were exogenous to economic theory and financial indicators. Previous studies cited by YZZ had shown that the mood elevating and depressing effects of sunshine and Seasonal Affective Disorder (SAD) correlate with stock market returns. The authors also considered the popular (astrological) wisdom that moods and behaviors change relative to the lunar cycle. Sunshine and lunar cycles are both exogenous factors but unlike sunshine, lunar cycles are predictable. Given the extensive documentation of correlations between full moon periods and disturbances such as sleep deprivation, depressed mood, and suicidal events, the authors hypothesized that investors may value financial assets less during full moon periods than during new moon periods due to the associated changes in mood. A relationship between lunar cycles and stock returns would indicate that stock prices are predictable but not correlated with rational economic fundamentals or market efficiency (YZZ, 8). The YZZ study differs from previous studies of lunar cycles and stock performance, which had tended to analyze single market indexes such as the DJIA. It examines returns, rather than stock prices and it examines a large global sample of data from 48 countries, which the authors say increases the power of the tests. They evaluated market data for all 48 countries together and in sub-categories identified as the G-7 countries, developed countries (N=23), and emerging market countries (N=25). The authors examined mean daily stock returns for full and new moons periods, each specified within 15 day and 7 day windows (YZZ 4, 15). The authors' data collection and analysis of "returns" are not explained clearly for a lay audience. Presumably the daily opening and closing figures for each market were observed and the means of the daily differences were analyzed for a window of 15 days centered on new and full moons and again for a narrower window of 7 days centered on new and full moons. For the global portfolio, the authors' analysis showed strong evidence that stock returns are lower on days around the full moon than on days around the new moon. The mean daily difference in returns was 5.4 percent per year based on the 15-day window specification, and was stronger at 6.9 percent based on the briefer 7-day window. Under both specifications, the return difference is statistically significant at the five percent level (P<0.05) (YZZ, 15). The results were similar for the separate portfolios of G-7, developed, and emerging market countries, with the lunar effect being larger in the emerging market countries (YZZ, 18). Regression analysis determined that the effect was not related to trading volume or market volatility (YZZ, 20-21). The empirical evidence indicated significantly different stock returns during full and new moon periods, but the authors also looked at other possible causes that could explain the results. They investigated whether this observed effect was related to calendar-related anomalies, specifically the January effect, the day-of-week effect, the calendar month effect, and the holiday effect. They found these effects to be unrelated (YZZ, 21-24). They also examined the robustness of the lunar effect by testing a regression that shifted the starting point for the cycle by 1 to 29 days (the duration of the lunar cycle) and the effect was found to diminish with the size of the shift (YZZ, 25). 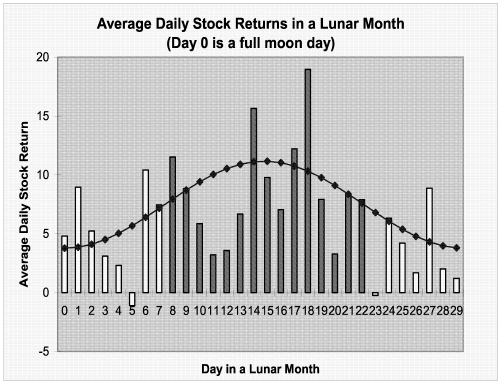 As indicated in the following figure, the researchers found a cyclical pattern in the stock returns that corresponds to lunar phases. The bars in the figure show the average daily stock returns for the 29 days of a lunar month based on an equal-weighted portfolio of stock indices for the 48 global countries (YZZ, 46). Day 0 represents the full moon and the dark bars between day 8 and day 22 represents the 15-day new moon analytic window. The stock returns were significantly higher in the 15-day new moon window and even more so using a 7-day window. The curved line is the derived sinusoidal model of the cyclic lunar effect on the stock returns. The authors knew from the existing research literature that the investments decisions of individual investors are more likely to be affected by moods (loss aversion, overconfidence, and so forth) than the decisions of institutional investors. Furthermore, empirical studies had shown that large capitalization stocks have a higher percentage of institutional ownership than small capitalization stocks. This information suggested an additional parameter for the lunar effect. The authors' analysis of large cap versus small cap stocks provided evidence of a stronger lunar effect for individual investor ownership and also for the observed stronger lunar effect in developing countries where individual ownership is high. This analysis added further support to their hypothesis that lunar-driven moods and sentiments affect asset prices (YZZ, 20). The authors claim that their research supports a predictable lunar trading strategy that is not consistent with the predictions of traditional asset pricing theories that assume fully rational investors. 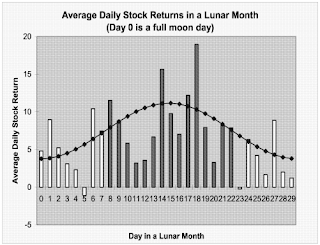 They suggest further experimental studies to better understand the psychological effects of investor behavior on stock returns and how trading behavior varies according to these effects at different stages of the lunar cycle (YZZ, 20). A separate study published in 2010 by Royal Bank of Scotland analysistsTom Pelc and Dmytro Bondar (P&B) observed lunar cycles in relation to FTSE 100 and S&P 500 indices. These authors observed that an index's daily change is significantly higher on new moon days than on average. Regardless of which direction the index moved, the average daily change was 0.02% but the average daily change on a new moon day was 0.13%, which was 12 times greater (P&B, 1). In terms of a lunar cycle investment strategy, P&B found that a strategy of buying on new moons and selling on full moons (bn/sf), produced significantly better returns than the reverse strategy (bf/sn) or simply holding. A £1,000 investment in S&P in 1928 would be worth £62,864 in 2010, but by working the bn/sf strategy would be worth £1,502,689 over the same period (PB, 2). This P&B observation raises interesting questions. The YZZ study would seem to suggest greater returns in global markets, particularly in developing countries, by using a bf/sn strategy. Why are the lunar associated trading moods so different for the top indexed shares in developed countries compared to developing countries? What are the driving moods in each case and how is this apparent contradiction to be resolved? In astrology, all of the planets are thought to be associated with moods, urges, and behaviors, not just the moon by itself. Whether the planetary urges and moods are thought to be irrational, as YZZ described them, or rather intuitive, creative, and adaptive as they are more often described in astrology texts, the more important question from a scientific perspective as whether the associated behaviors can be empirically quantified and evaluated. In theory, additional planetary factors, evaluated in economic terms, should help to explain and predict the urges driving stock market behaviors in greater depth and detail than either of these studies suggests. A good example of a software program that attempts to gear the complex astrological patterns of both major and minor planetary aspects to stock market activities is the Technical Aspect Oscillator for the Dow Jones Industrial Average (TAO DJIA) developed by American researcher Richard Schultz. Schultz claims that for the 10+ year period he tested between 1999 and 2009 the TAO Forecaster output, as analyzed by Pearson Product-Moment Correlation, produced r = +0.67 for the DJIA and r = +0.76 for the S&P 500, with a statistical significance of P<0.0001 (Schultz, 2010). Although the TAO Forecaster is retro engineered to fit existing data patterns, the objective is to gain economic and sociological insight into market behaviors and predict patterns before they occur. Schultz regularly reports on the TAO Forecaster's performance on his Schultz on Market Cycles blog. In astrological theory, all cycles are developmental. The cycle that the Moon makes with the Sun, and the cycles that all the planets make with each other, are thought to associate with the developmental stresses that occur when concepts and beliefs are challenged and transformed in their various phases. Depending on the planets involved, the implications of these developmental processes can range from the trivial to the revolutionary. These planetary patterns are complex, but as the YZZ and P&B lunar observations have demonstrated, individual astrological cycles can be isolated and empirically evaluated as significant driving factors related to behavior. Schultz, Richard, Schultz on Market Cycles blog, retrieved on 2013-09-08. Schultz, Richard (2010), "The TAO forecast of Down Jones Industrial Average". Cosmic Patterns blog, updated on April 1, 2010, retrieved on 2013-09-08. Pelc, Tom and Dmytro Bondar, "Sheer lunacy staring at the heavens," The Royal Bank of Scotland, Charting, Equity Special (Esoterics) blog, 7 July 2010, retrieved on 2013-09-08. Yuan, Kathy; Zheng, Lu; Zhu, Qiaoqiao. "Are Investors Moon struck? - Lunar Phases and Stock Returns" Journal of Empirical Finance. 2006, 13(1), p.1-23.